Get inspired for the excellent Thriller Dance Class... Get your Zombie costumes ready for the ultimate Michael Jackson Dance Class. A fun-packed session, that will leave you with memories for years to come! Get inspired for for your next foray into the clubs with the excellent Thriller Dance Class... Get your Zombie costumes ready for the ultimate Michael Jackson Dance Class. Well now is your chance to learn to dance like the best with this fun-packed session, that will leave you with memories for years to come! You're in very good hands with an industry professional dance choreographer, who will provide you all the coaching required for you to master the moves. 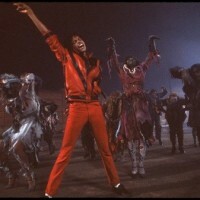 You'll be taught the steps to one of the most iconic pop songs of all time; Thriller. It doesn’t matter if you have two left feet; this class is all about having a good time! And this one is fun for all ages. Works really well for any group activity, especially for hen parties, birthday weekends and corporate events. The class is approximately 90 minutes long. It usually takes place in a dance studio or town centre club function room. Lead role for Hen or birthday girl. Other MJ hits included, including 'Beat it’ and ‘Bad’.